Peter Bryer: Mobile Foresight: Skating to where the puck is growing next. Good foresighting is only part of the game. Skating to where the puck is growing next. Good foresighting is only part of the game. My talk was about some of the lessons I learned during my decade and a half working with Nokia including the dangers of taking the cash cow for granted while pursuing stars, the threats of egocentrism, and the threat of dismissing wounded competitors. The article used the ice hockey metaphor of the importance of skating to where the puck is going to be, not to where it is now. The article points out that it was such a foresighting instinct that made Wayne Gretzky a great player. Similarly, businesses should have the foresighting ability to go to where the action will be. It does make for a good business-world metaphor. But let's throw out some scenarios. What if you have the foresighting instinct to see where the puck is headed but aren't too good at skating (bad at implementing), or you are looking a bit too far ahead and you waste time waiting for the puck to come to you (bad timing). 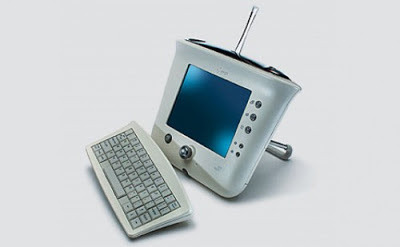 A company called 3Com introduced the "Audrey" tablet computer back in the year 2000. The device was a bit bulky and awkward to use (implementation) and many of the enablers weren't quite ready at the time like the screens and wide WiFi adaption (timing), but we have to give them credit: they certainly were skating to where the action would be -- about ten years before it got there. They were waiting there with hockey stick in hand until the product and later the company died of boredom. The road to oblivion is sometimes paved with good inventions. I've deviated Woody Allen's success quote before on this blog. I will do it here again: 80% of success is showing up at the right time and in the right style. In the mobile game, the ultimate goal is not just to make a goal, but to win the title match season after season. That's the real trophy. That's the real trick. But if you don't realize when you are skating on thin ice, it might be time for the coach to call a timeout. Or it might be time to replace the coach. Y2K problem? The Audrey tablet device (picture below) from the year 2000. 3Com (three who?) skated to where the puck would be a decade too early.